« John Murray creates dazzling environments for high-end corporate clients. 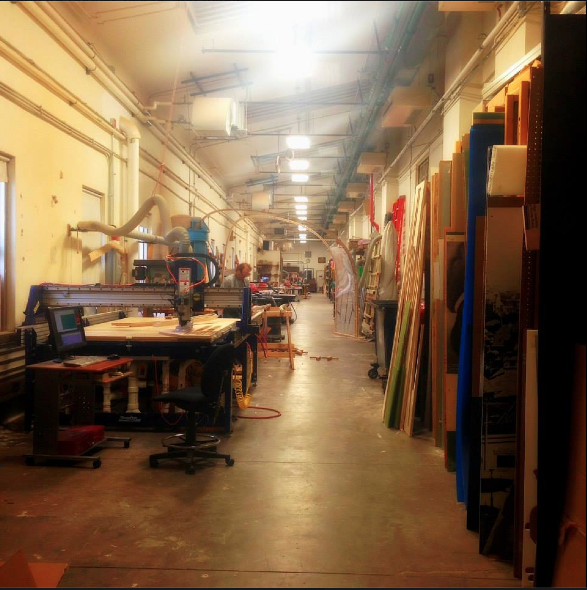 Look closely and you can see John Zehren in The Field Museum’s Production Shop, just behind the shop’s full size ShopBot PRSalpha CNC router. John is the Exhibitions Productions Shop Supervisor, and has been with The Field Museum in various capacities since 1997. 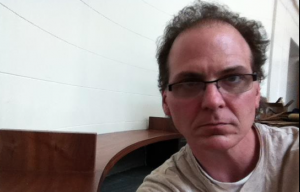 In addition to John’s expertise in cabinetmaking and case-making, he is an experienced sculptor and welder. More broadly he views his role as an educator as well, to production designers and technicians at the Field, as well as to school groups he visits around the country. As described on its website, Chicago’s Field Museum’s mission is to “inspire curiosity about life on Earth while exploring how the world came to be and how we can make it a better place. We invite visitors, students, educators and scientists from around the world on a journey of scientific discovery. On display now are featured exhibits such as “Biomechanics: The Machine Inside,” where visitors can “find out why every living thing—including humans—is a machine built to survive, move, and discover, and explore the ways in which these marvels of natural engineering have inspired ingenious man-made mechanisms. 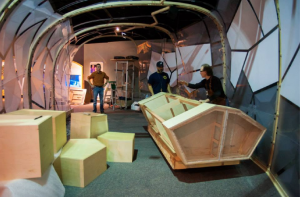 I caught up with John by phone recently to learn more about what goes on behind the scenes to make the Field’s exhibits so dynamic and interactive. MB: Can you talk a bit about the Biomechanics Exhibit as an example of using CNC in your production process? JZ: Absolutely. There are dozens and dozens of great examples; we use the ShopBot as well as 3D printers in almost all of our work now. For Biomechanics, one of the coolest installations was the Heat Theater. The initial idea here was to create some sort of immersive, almost 4-dimensional theater world that people could walk through, in order for visitors to experience what it feels like for animals and humans to live in every different climate on Earth. I built the wooden-framed structure that the Theater would “hang” onto…you can see here it’s a cave-shaped, 30 foot long by 20 foot wide arching structure. It’s sort of a warped quonset hut that needed to go together and come apart easily. The joints snap together and come apart very easily — and it’s the CNC technology that really enables us to do this kind of structural design and build. You want to be able to take it apart, put the entire framing into one crate, and send it off to its next location. Ideally, it’s best that one person be able to construct and deconstruct the installation; it’s possible with this kind of designing for CNC cutting. MB: And the Brain Scoop video? JZ: Building this Heat Theater with the ShopBot is a good example of how digital fabrication has really changed everything about museum production. 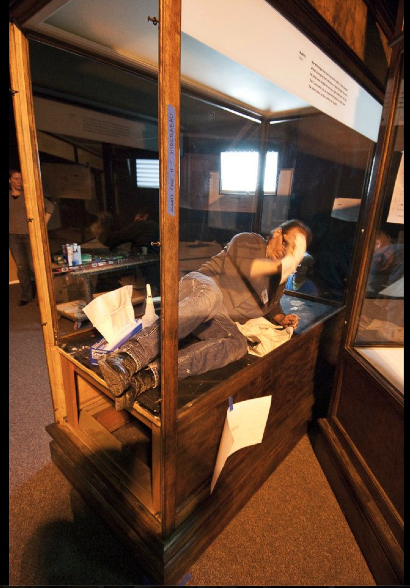 Traditionally, a lot of museum production work has been at its essence about cabinetry: figuring out the best way to house whatever it is that you are displaying — “building boxes” if you will. When it comes to building those boxes, CNC has enabled us to make huge leaps in terms of constructing near-perfectly airtight display units — on its own a big achievement and I can say more about that. But CNC also expands the possibilities for installation design creativity. As you can see in the video, the nature-inspired shape of the Heat Theater was made so much easier to pull off with the technology of the ShopBot. MB: How long have you been using the ShopBot? JZ: We purchased the ShopBot tool in 2010. And it’s fascinating because adding the CNC cutting station to the shop allows for two processes to emerge. On the one hand, it helps to eliminate operator error and reduce material waste… a person can be trained to run the tool to make the needed cut AND… this same person, if they’re intrigued about the technology and where it can take them, can start to learn how to alter and improve the DESIGN of what they’re working on. So it’s not just about “pushing a button” and stepping back. It’s about learning how to grow as a designer and builder. MB: Tell me about your work on improving display case design and construction. JZ: This is an area we’re quite proud of. When it comes to case-making, your goal is to eliminate acidity from the air inside the case, and reduce the speed of air exchange — the time it takes for the outside air to fully replace the air inside the case. All of this is in service of preserving whatever artifact you have placed on display. For many years, wood has been the material, and it is deadly to artifacts because of its natural acidity. The acid leaches into the air and harms the artifact. 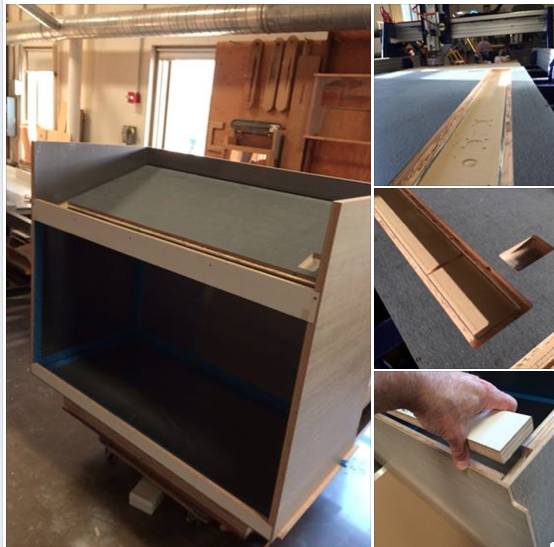 So we’ve been designing cases with aluminum sheeting facing inwards, and making lots of advances in making more perfect seams. This is enabled by our use of CNC technology. I’ll brag a little. We’re now able to build cases where the air exchange is slowed to about 10 days, whereas the typical rate of air exchange is around three days. And we’re able to create these cases for substantially less cost than is the norm. We’re sharing this knowledge too! I’ve written a paper about our work, and we’ve been sharing our work with colleagues around the country. Every musuem is on a budget — so we’re trying to help others benefit from what we’ve learned here at The Field. 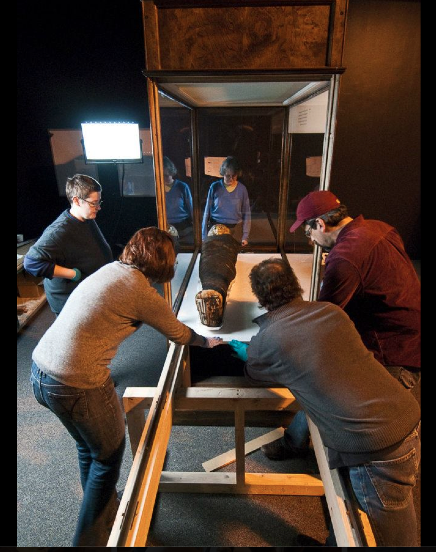 MB: We’ll close by sharing some photos of John and his team doing the installation of “Opening the Mummies,” a 2012 exhibit at The Field. 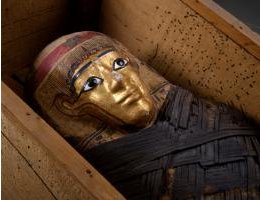 This exhibition features two ancient Egyptian mummies in Field Museum collections, displayed in their coffins. These mummies were formerly displayed in the Yate exhibition Opening the Vaults: Mummies. Without unwrapping them, the Field’s CT scans and the 3D imaging in 2010 made clear that these mummies were not merely objects #30007 and #11517 but real persons who lived and died thousands of years ago. The Field learned that one mummy was a woman in her forties with curly hair. The other was a teenage boy, who was buried in a coffin too big for him. 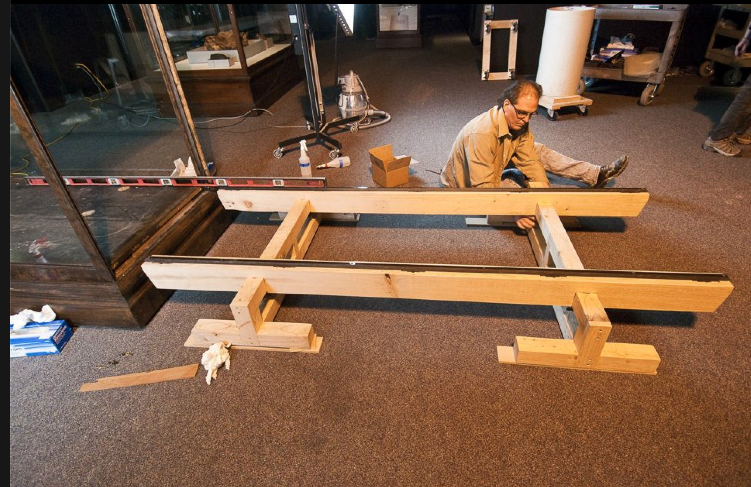 Setting up and leveling the rails which support the case deck prior to installation. Display case for mummy 30007 is a tad small for John. Pretty cool for a day job, eh? And we didn’t even get to John’s work welding on dinosaur skeletons! 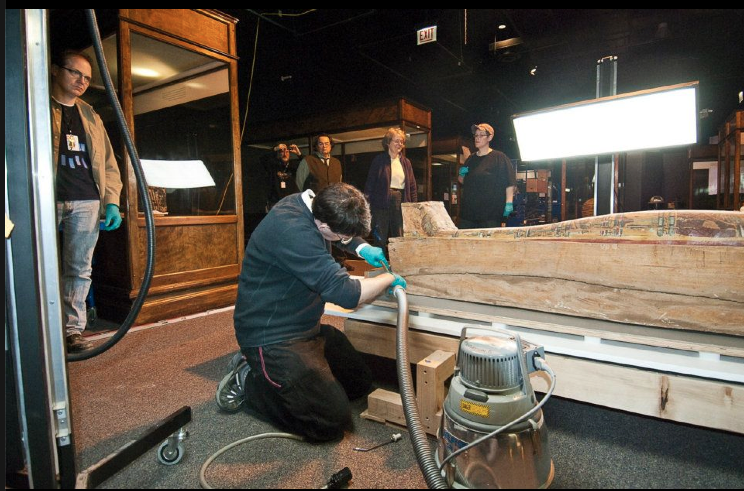 2 comments to Chicago’s Field Museum uses the ShopBot to put everything on display. As a young boy growing up in Rockford, I took many trips to the Field Museum over the years. Every time I went, it was special, and I learned more than when I got there. It is gratifying to know that they are still doing great work and I am in awe of the craftsmanship displayed be all involved. Keep up the good work and thank you for making a young boy’s dreams come true. Even now as I quickly approach 60 years young, I continue to visit.